Each year, our leukemia and lymphoma program cares for more than 150 newly diagnosed patients using a variety of treatment protocols, including blood and marrow transplant(BMT), hematopoietic stem cell transplant, chimeric antigen receptor(CAR)-T therapy, and Phase I and II trials for patients whose cancer has relapsed or is not responding to treatment. Leukemia is a cancer of the white blood cells. When a child has leukemia, the bone marrow produces a large number of abnormal white blood cells that cannot protect against disease and causes poor immunity. They also interfere with the child’s production of red blood cells and platelets, which can cause anemia and bleeding problems. Lymphoma is a cancer that starts in a child’s lymphatic tissues, including lymph nodes, thymus, spleen, tonsils or adenoids, and can involve the bone marrow. Lymphoma is the third most common type of cancer in children. The Aflac Cancer Center is a top choice for the treatment of childhood leukemia and lymphoma, as we combine the latest proven technology and research with a caring, family and child-friendly approach. 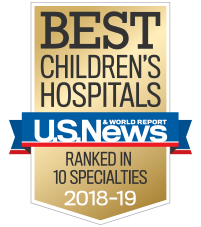 We are home to one of the the largest pediatric cancer programs in the country, which follows more than 780 children and young adults with leukemia and lymphoma each year. U.S. News & World Report ranks us among the top pediatric cancer programs in the country. We have physicians with national Children's Oncology Group (COG) leadership and expertise in ALL, AML, CML and Hodgkin lymphoma. We are one of a select group of centers offering CAR-T cell therapy for relapsed leukemia, as well as ongoing research to develop new CAR-T cell technology. Our team is leading a first-in-pediatrics study examining the effects of combining everolimus with other T cell-specific chemotherapy in children with relapsed or refractory T cell ALL (T-ALL) lymphoblastic lymphoma (LLy). The goal of the study is to allow more T-ALL/LLy patients to attain remission and proceed to a stem cell transplant. Our team is committed to advancing research and medicine by developing new techniques, treatment and cures for children and young adults with leukemia and lymphoma. We are home to one of the largest clinical trial programs in the country—offering our patients access to some of the most novel diagnostic and treatment options in the country. Our interactive translational research program works to apply new knowledge and advances in the fight against cancer.